Little boy baseball season starts today! This will be Will's second year and third season playing tee-ball here in College Station, and he's really excited to get the ball rolling. In an exciting but also nerve-wracking and "what were we thinking?!" turn of events, Tom and his friend Aaron (Will's buddy Logan's dad) are coaching Will and Logan's team. And although this "project" has already been quite a bit of work (I'm handling the administrative details so as to keep the load on Tom and Aaron's shoulders a little lighter), I absolutely can't wait for the season to get underway. Forget Soccer Mom - I'm fully embracing Baseball Mom. To get ready for the season we headed over to Olsen Field at Blue Bell Park to watch the Aggies play, and Tom and Will have been playing quite a bit of catch in the yard. Miraculously, Will has somehow learned how to actually catch a ball (a ball that's thrown to him, as opposed to a ball that's gingerly tossed directly into his glove), which has made playing catch considerably more enjoyable for both him and Tom, and should make the upcoming season a little less frustrating and a lot more fun. CSLL players don't actually pitch to other players until they're nine years old, but Will's already started thinking about pitcher as a possible position down the road. When he saw these pictures, Will commented on how solid his form looked (?). I had no comment initially (what do I know about pitching form?! ), but when I looked at Will's pictures next to his Aggie pitcher buddy's pictures, I discovered that he just might be right. 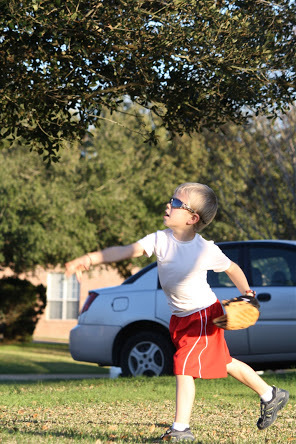 I take absolutely no credit for Will's throw - it was the Aggie baseball players who taught Will how to throw correctly in the first place - but I sure am proud. And the fitness enthusiast in me is also kind of proud of the muscle definition in Will's arms. And so it begins...let's play ball! I couldn't not post these videos of Will - the first of of one-year-old Will singing "Ball Me Out to the Ball" (Take Me Out to the Ball Game), and the second is Will's first baseball highlight reel. I love those old videos, I'm so glad we have them! classics.